This modern and high end property takes place at the epicenter of the Montenegrin coast. Budva is the place where all the summer magic happens and which makes you you feel you are in the middle of it all – night clubs, parties, beaches are only few steps away. 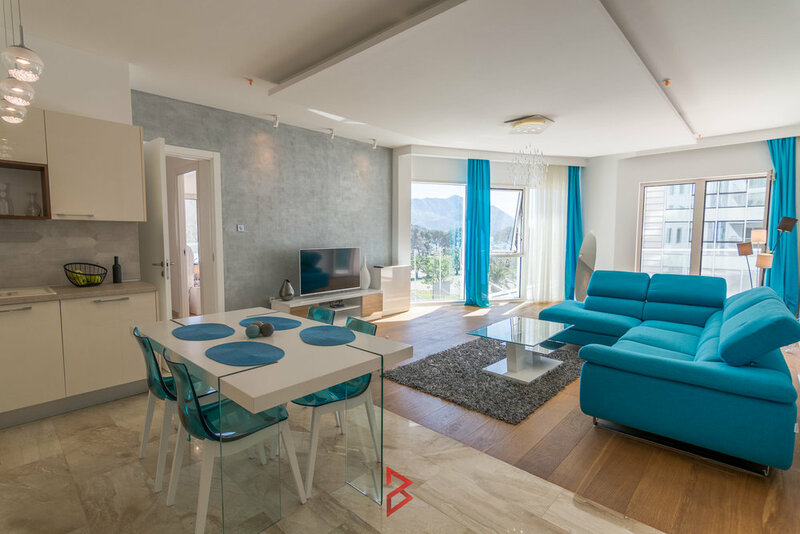 Apartment is located in the heart of Budva, just next to sandy beach and in close proximity to the historic part of the town, Old Town of Budva, as well as Budva marina. Within the building you can find a la carte panoramic restaurant, amazing spa center, swimming pool with a view of the bay of Budva, which makes your stay very comfortable and pleasent. This 104 sqm, two bedroom apartment is located in the central, out of three towers of the complex, with south side orientation, providing a lot of sun during whole day. It contains two bedrooms, two bathrooms, a kitchen, open concept living room and dining room, entrance area, and two seaview balconies – one is being accessed through the living room, while the other could be accessed from both bedrooms. The property is equipped with high end finishing materials and equipment, such as Mobiliario Royo, Villeroy&Boch, Inda sanitary equipment, Hansgrohe taps and mixers, Zehnder towel radiators, marble stone Quantum Quartz and such.